How do you spice up a dull but staple recipe? Yeah, I don’t know either, but I do know that today’s Nice Price or Crack Pipe Camry is spiced up by having a five speed stick and being a utilitarian wagon. Let’s see if that makes its price palatable. While there my not be many left on the road the words “how much would you pay…?” and Yugo” still seem to be considered very much mutually exclusive terms. That was made plainly evident in both the comments and the massive 82% Crack Pipe loss suffered by yesterday’s 1988 Yugo GVX. Now, the Yugo has the distinction of being considered by those with limited historical exposure to have been the worst car ever sold in America. It’s made many worst 10 lists, and has become a punch line in such movies as Drowning Mona and Nick and Norah’s Infinite Playlist. Here’s the thing, those movies were equally as bad as the Yugo, so screw them. If the Yugo is the worst car ever sold—poorest reliability, questionable driving capabilities—then what would be its opposite? What would be the Superman to its Bizzaro Superman? If you said the ‘80s Toyota Camry and then nodded off to sleep at the thought, wake yourself up and give yourself a gold star. 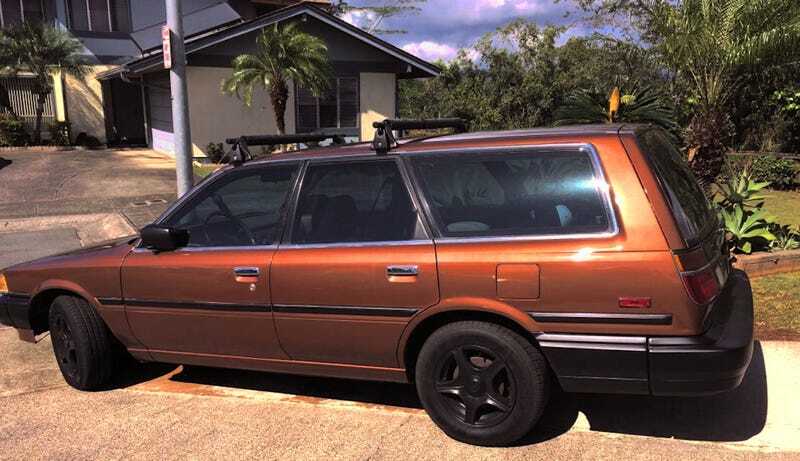 Here we have a 1987 Toyota Camry wagon—the most exciting of the late ‘80s Camrys owing to its carrying capacity and sort of cool Audi-ish style. Sadly this isn’t the later model with TWO wipers on the back hatch glass, but this one is root beer metallic brown so that makes up for the lack of proper wiper quotient. It’s also a five speed stick which as we all know can transform any car from dull-as-dishwater to don’t-mind-if-I-do in no time flat. Hell, put a five-speed on either Trump or Clinton and see if you don’t like either of them just a little bit more. Putting down the power here is Toyota’s 3S-FE, a 115-bhp 16-valve four of 2-litre displacement and a rep for loving the revs like the kids like the Pokémons. That may not seem like it’s a big corral, but with less than a ton and a half to move around, it’s not bad. Speaking of not bad, this 103K Camry presently calls Hawaii its home. It’s the perfect car for that island paradise for two reasons. First off, it stands in perfect contrast to the sea of rental convertible Mustangs the tourists trade for their 787s at the airport so you’ll easily be eyed as a local. Next, the long roof and requisite long roof rack make it the perfect hauler for surfboards or that whole hog you drunkenly volunteered to bring to the neighbors’ backyard luau. Pass the poi! That roof, along with the rest of the body, looks to be in pretty good shape, and the damp Hawaiian climate has done wonders on keeping the black rubber bumpers from turning to dust. There’s some confusion regarding the wheels as on one side there appears to be some black painted aftermarket alloys while on the other side the car is sporting black painted steelies with like-hued Pep Boys covers. But hey, people covet the Dino 206 despite the cars being dimensionally dissimilar from side to side, so just tell people it’s like that. Old Camrys are known for being pretty well screwed together and having been made of some tough materials so it’s unfortunate that we don’t get any interior shots here. What we can glean through the windows however, is that the seats are covered with some sort of Tijuana blanket covers. There is the boast in the ad that the radio has been updated too and has Bluetooth if that’s your thing. The ad also claims that the wagon has been restored (?) and has “many new parts.” It doesn’t go into detail as to what those might be, but hey, it’s in Hawaii so you’d probably get distracted too. What you might also find distracting is the price, which is $5,500 or the same as yesterday’s Yugo. What do you think, does this Camry present a better argument for paying that much? Honolulu Craigslist, or go here if the ad disappears. H/T to 94GTratracer for the hookup!